It is this time every year that I review the goals that I set at the very beginning of the year. It has been a very eventful year, and one that I have fond memories of. I learnt more than I could have imagined, both academically and skills for the future. Also, I worked less this year than any other year in my working life due to the need to take long service leave to recover from a surgical procedure. Vegetarian days – We have been eating at least one veggie meal a week, sometimes two, but we still have a relationship with meat. My favourite veggie meal is Goulash with chive dumplings and mashed potato. It is a great winter warmer and we serve this at least once a month. Stay tuned for more news on the veggie front in tomorrows post. 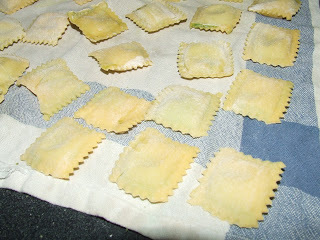 Home Made Pasta – Well it started out well, but kind of fizzled out. I have made pasta about 5 times during the year, which has just the best taste, but convenience always wins out in the end and we go back to dried pasta for a while until we get the spare time to make some fresh. Ravioli is my favourite, but you really need four sets of hands to make it with the machine I use. 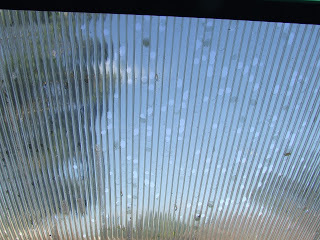 Increase water storage – It took a while to save up the cash, but I finally managed to install a gutter on the carport and install a 1800 Litre rainwater tank. Then as fate would have it, my existing 2300 litre tanks strung a leak due to being laid on an uneven surface. 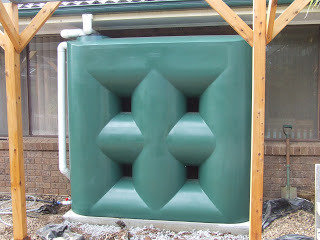 So, a fortuitous tax rebate assisted me in purchasing and installing another 2300 L tank. Plus I also have three 210 litre water barrels that are full, and three 100 litre water barrels that need to be connected up to the irrigation system when time permits. That will give me a total of 5030 litres (1,328.7 US Gall). For an average suburban yard, that is a fair bit of water! 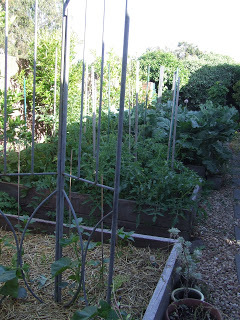 Two more wicking beds – Unfortunately, this goal was not met. Due to the Clay Cob Oven build, I had to disassemble my existing wicking bed and build a new one in its place. At least I still have one, which is working well. The only problem I have is that the soil that I put into it is too acidic (pH 9.5) and I have been adding dolomite lime to it once a month to slowly bring the pH down to 7. And besides that, I have kind of ran out of room to put in new beds. I have to start growing upwards now. 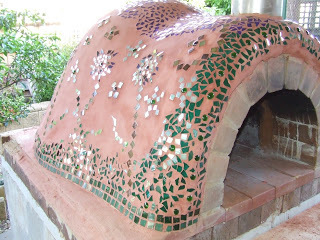 Clay Cob Oven – After much procrastination, I finally bit the bullet and started the cob oven in July and we finished it in October. It was a labour of love in the end, and each weekend we just knew that we had to work on it to get it finalised. The project helped me learn some bricklaying skills and patience, and it was a steep learning curve trying to figure out how to cook in it. 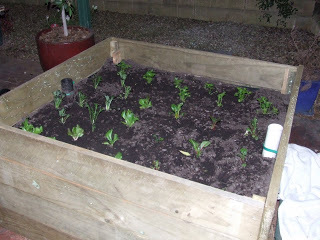 Kim and I are very proud of our handy work, and the help from the Melton Sustainable Living Group. Building the cob oven was rewarding. Portable devices – What a dud! The device I bought to recharge small electronic devices takes far too long to recharge in the sun, and does not fully recharge devices when at capacity anyway. The only device it does fully charge is my very old school Nokia mobile phone (circa 2005), which just goes to show how energy hungry today’s devices really are. At least I tried to give it a go. Now for the adhoc stuff that were not goals, but significant events in their own right. I will just list them, because if you have been reading all year, you will know most of these. So, was 2011 a fulfilling and thoroughly enjoyable year with more ups than down? Too right it was, and even with a hernia surgery thrown in as well! We all had a ball, and kept on living and behaving larger than life on our journey towards a sustainable lifestyle. Most importantly, we had fun and lots of it! Stay tuned for my 2012 goals. I think they will a modest few this year, but will reduce our environmental footprint dramatically. If you are like me, you hate to waste food. Whether you grow it yourself or buy it from the farmers market or at a pinch the supermarket, so much energy and water goes into growing our food that it is almost a crime to waste it. All those food miles consumed just so we can throw it away into landfill to generate methane, which is 21 times more potent than carbon dioxide as a greenhouse gas. Talk about a double whammy! No food scraps enter our landfill bin at all. There is always some animal willing to consume it, whether it be beast or insect! So on that note, here is a great video that shows just how much food is wasted during production and consumption in Australia. It featured on the Hungry Beast show on ABC. It certainly was an eye opener for me. Half the mango crop thrown away? What an atrocity! 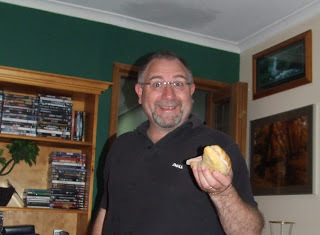 More on food in a post very soon…. I have a surprise for everyone! It was an exciting and eventful day on many fronts. 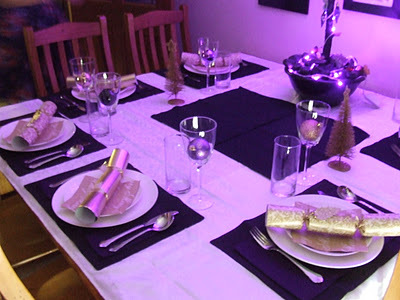 It was our most sustainable Christmas to date as we took a minimalist approach. Up early at about 7 am and did all the chores (chooks, watering, compost) before Megan and Jake arrived at 8.30am. Firstly, before any gift giving, we made and ate breakfast. Our tradition is to make up croissants with ham and Swiss cheese then popped in the microwave for 25 seconds each to heat them through. Served with a glass of Bucks Fizz (champagne and orange juice). 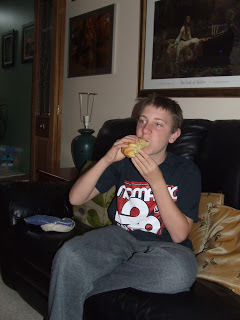 Ben on his second croissant! I am very excited! After all that was scoffed down, it was time for presents. Ben had been waiting very patiently. 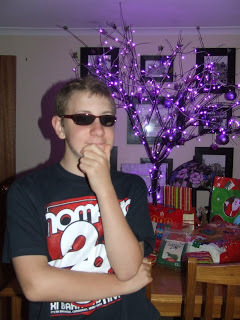 Ben trying to be cool! Our tree was very minimalist this year. 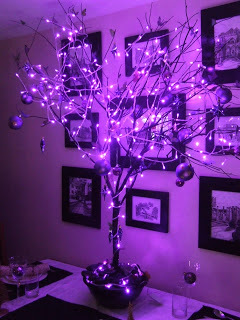 It is a old fallen branch of one of the trees out the back, painted black and decorated in purple LED lights and baubles. Beats cutting down a tree, or buying a plastic one. All very friendly for the environment. Anyway the rules this year were simple. Kim and I didn’t need anything and we requested that the kids did not buy us anything either, as I just got a new rainwater tank, and I bought her a new laptop earlier on in the month. However Megan broke with tradition and bought us a set of 3 bamboo chopping boards. Santa brought Amy, Thomas (Amy’s boyfriend), Megan, Jake (Megan’s boyfriend) and Ben a few small, practical gifts each. Ben received some PC games and books, Amy got a spade, two pruning saws and some gardening gloves for her new garden. 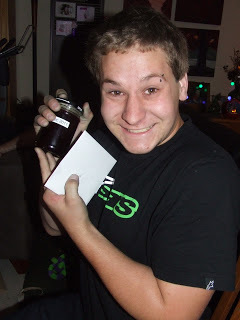 Megan received a cookbook, and Jake got some Cherry Jam which I think he really appreciated. Any wrapping paper was recycled or put away for reuse later on. 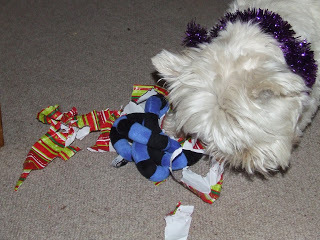 Even the dogs got a gift each which they both opened by themselves (clever dogs). 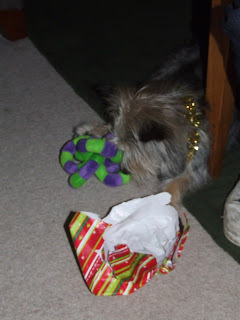 Teddy’s first Christmas with us, and he knew exactly how to open it! This was the best present of all. 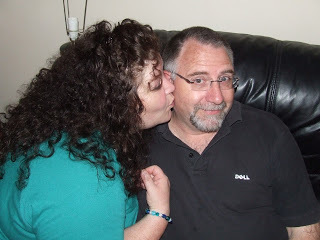 A cheeky kiss from my gorgeous wife Kim. What else would a man ask for. Once the gifts were exchanged Megan set the table for the six of us. It was beautiful and very purple! It was getting a bit hot for Kim (32C) so she and the kids went for a swim in the pool, whilst I prepared Christmas Dinner. I glazed a free range leg of ham with cherry jam and cloves and popped that in the oven. Then I prepared some bio-dynamically raised chicken breasts by stuffing them with a mixture of Kim’s herb bread (breadcrumbs), fresh sage leaves and pine nuts, and wrapped them in prosciutto then baked in the oven. We had local roasted potatoes, steamed carrots, cabbage and broccoli and Kim made some Yorkshire puddings and a red wine gravy. It was all washed down with some local Rose wine. For dessert Kim made a Pavlova with fresh cream and berries. During dinner Kim read out a letter written by Adam, who is living in Cologne, Germany with his girlfriend Sina. The letter was very witty and made us all cry and laugh at the same time. We had each written a letter to him and sent it over a few weeks ago, which he read to Sina whilst holidaying with her family in the Black Forrest. 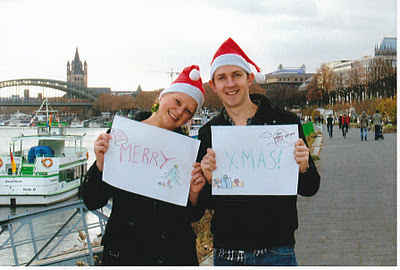 Adam sent through a few photos of him and Sina with the letter, which were very nice. After dinner the kids helped clean up and played some board games then left at about 4.30 pm. We all had a great day and then things changed weather wise. From a hot 32C it dropped 10 degrees in 10 minutes. Massive thunderstorms started to develop, and then the heavens opened up and down came the hail. It was not too big, about the size of a 5 cent piece, but large enough to knock most of the peaches off of our tree and to damage the greenhouse. Across the north west of Melbourne there were reports of golf ball sized hail and smashed house roofs, cars dented, and flash flooding. One of the greenhouse panels. Lots of little holes, but as luck would have it, only to the outer layer. They did not go all the way through so the greenhouse survived. The vegetables all survived except for a few leaves chopped off here and there. 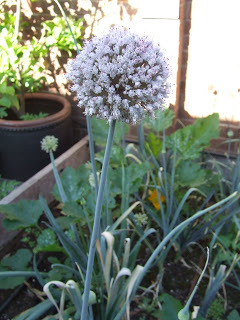 This beautiful leek flower came through unscathed. 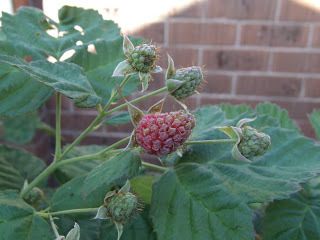 The loganberries keep on growing larger and larger. 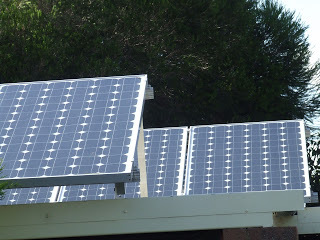 But best of all the solar panels are fine. After a quick inspection they are nice and clean after the 24 mm (1″) of rain that fell on Christmas Day! No hail damage at all. All we have to show for the four thunderstorms is a very soggy Cluckingham Palace, and two overflowing rainwater tanks, which all in all is a blessing compared to some of the news reports around our area. Apparently there was even a tornado touchdown in the bush about 20 km away from us! Mother nature showing her wrath no doubt. Enough said and we all know the reason for this crazy weather, don’t we? I am taking a bloggy break until New Years, so it is fair the well from me for a few days as I relax with family. How was your Christmas/Holiday? Leave a link if you have a post/photos. I would love to read them.